By Bruce Walton | The Chronicle-Telegram Published on Feb. 25, 2019 | Updated 6:37 a.m.
LAGRANGE — The village administration held its first open house at the former high school that has been transformed into village offices. Mayor Kim Strauss said the event was to show the residents the hard work they’ve put into the building, and the potential it has for later renovations. Although the building has been open to the public, this, he said, was the official debut. “This time we opened everything and people can even wander and see what we’ve done, and I think we all enjoyed it,” he said. LaGrange has been working on renovating the old high school and middle school, which are connected, for a couple years now — changing some of the flooring, layout and structure, while also keeping true to the original style and design of the school. The village closed its offices at 355 S. Center St. late last year to move into the newly renovated offices at the former school. On the tour, residents could see those changes like in the old library from Keystone Middle School that became the new police station, which gives the department an estimated six times more office space than it had at the old location, according to village maintenance employee Mike Kroupa. The public entrance to the police station is the lobby of the former Keystone Middle School, which remains much the same as it did when the school was in operation. The woodshop room was converted into a garage that can hold six vehicles for the police department while the cafeteria was transformed into the new council chambers. The residents also had a chance to see the school they or their children might have attended. Janet and Ronald Mertz both had attended the three-story section of the school — the oldest portion built in 1899 — that was demolished. But the couple had four children and six grandchildren graduate from the district that went through the school. “I think it’s nice, they did a wonderful job,” Janet Mertz said. Strauss said the village looked into building a new village facility, but the project would have cost about $2 million. The total cost of the renovations at this point is about $400,000, he said. There’s still more classrooms to be renovated, but what they have right now is enough for the administration offices. In the future, Strauss said he hopes the city can renovate the old gymnasium and rent spaces in the rest of the building to help pay for the utility bills. LAGRANGE — For the first time in 25 years, there won’t be a LaGrange Firefighters Association country concert. According to LaGrange Fire Chief Jim Rader, the high cost to bring big entertainers to the small town is the reason behind the cancellation. The 25-year tradition also was a fundraiser for the LaGrange Firefighters Association, Rader said. Rader said the country concert was the largest fundraising event for the department. Over the years, it has allowed the group to purchase an equipment truck, 25 pagers for all volunteers to carry, and a roof ventilation chainsaw. With the loss of the country music show, the LaGrange Firefighters Association will have to look for other ways to offset the cost of new equipment. A local store is planning to help ease the burden. LaGrange IGA has stepped in to help with a summer fundraiser — a car show. Store manager Erica Domec said the local business knows the association needs to continue its fundraising efforts and is happy to help. “We just want to continue to help the fire department because we want to give back to the community,” Domec said. Contact Melissa Linebrink at (440) 329-7243 or mlinebrink@chroniclet.com. Follow her on Twitter @MLinebrinkCT. “We decided to help them by hosting the annual car show on July 20, and all the money raised goes directly to the fire department,” Domec said Saturday. Domec added that she has been in discussions with the LaGrange Fire Department regarding other fundraising efforts. Demolition costs were $173,000, not $373,000 according to Superintendent White. The school was given $1 million by the state to demolish the entire structure. Published on Dec. 15, 2018 | Updated 2:50 a. m.
LAGRANGE — Keystone Schools Superintendent Dan White said Friday he hopes to continue an open discussion with village officials about sharing utility costs for a gym in the former Keystone school buildings now serving as village offices. The use of the gym became the subject of controversy after village officials said Keystone Schools was not paying its fair share of the cost to keep the gym lit and heated. The gym use by school athletes had been agreed upon in the purchase contract between the village and the school district when the village bought the former buildings, and a formula for use fees was spelled out in the contract. White, whose first day as superintendent was Aug. 1, said he knew about the controversy from his first day on the job. Two days later, on Aug. 3, he said “student-athletes and coaches were unable to access the building” and found the gymnasium locked. White said the district had requested invoices for its share of the utility bills since September, but those were not delivered until November. Those were the first bills the district received, he said, and such a bill is required for the district to be legally able to cut a check to the village. The bill also was for more than the district thought it owed based on the contract, White said. 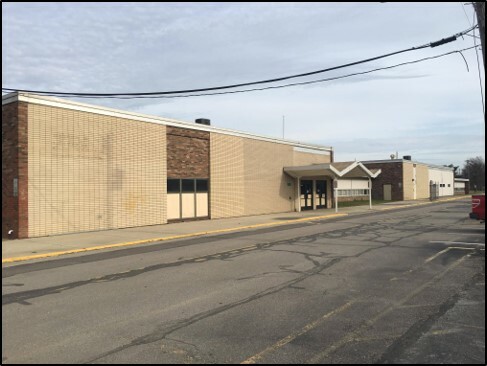 The district sold the former Liberty Elementary School and the former Keystone Middle School, football field and bus garage. The district spent $373,000 to demolish the Liberty building — far less than the $1 million it would have cost to demolish all of the buildings, White said. The purchase gave the village a new, more expansive home for its offices and police department. In the original Real Estate Transfer Agreement, signed Jan. 28, 2016, and provided Friday to The Chronicle-Telegram, the village agreed to purchase the former school buildings, parking areas and the Keystone football stadium and bus garage “as-is” for $1. The bus garage was leased back to the schools for $1 and the district retained exclusive use of the stadium and bus garage and related parking areas. All of this was rent-free, but a clause also noted that the district “will pay for its own operating costs in connection with its use” of so-called reserved use areas. And that is where divide seems to have occurred. White said “what’s very clear now is that our interpretation of the utility costs is not the same,” and both parties are trying to work that out. He said the district has a different understanding of the formula for sharing utility costs, and that is one of the sticking points he said he and village officials will sit down with and hammer out at a meeting Jan. 10. LaGrange Mayor Kim Strauss on Friday declined further comment on the matter. White said Friday he doesn’t feel it’s appropriate for the village to make money off the schools. Village Council members on Thursday said the same about the schools making money off the village. “That’s not an appropriate use of the funds of the Keystone Local School District,” White said. Published on Dec. 14, 2018 | Updated 6:46 a. m.
LaGRANGE — A gym at the former Keystone High School will continue to be open to Wildcat baseball and softball players for winter “open workouts,” Village Council decided by consensus Thursday. The use of the gym became the subject of controversy after village officials said Keystone Schools was not paying its fair share of the cost of keeping the gym lit and heated. An agreement signed several years ago resulted in the schools selling the building to the village for $1 and saving on the cost of demolition. Despite ballplayers still using the gym for open workouts, the utility bills were shouldered entirely by the village and its residents, Mayor Kim Strauss said. The village was presented with “a small check” last month to help defray the cost, he said. Parents of baseball and softball players, coaches and supporters of the sports programs who showed up at Thursday’s Council meeting said players had been locked out of the gym several times, and also were unfairly blamed for vandalism and theft there. Keystone baseball head coach Bert Fitzgerald told Village Council he didn’t appreciate his players being blamed, especially on social media, for alleged vandalism of the building. Village officials said they had kept the gym open for three years, allowing Keystone High School ballplayers to use it, without a penny shared for the cost of keeping the heat and lights on until last month, when “a small check” was received by the village, Council President Gary Kincannon said. In the three years prior, “we never collected a penny” toward utility bills, Councilman Barry Price said. Keystone Schools Superintendent Dan White, who also attended Thursday’s meeting, said the schools weren’t aware the bills were an issue until they were sent an invoice. At no time during the conversation did the schools want the gym locked, he said. Council members said they also wanted to find a solution, and didn’t want to bring attorneys into the matter. The village still is converting the buildings for use as the LaGrange police station and village offices, which moved in Oct. 29. Meanwhile, the village leased the bus garage on the property back to the school district for $1. Kincannon reminded the crowd of about 30 people — many dressed in Keystone Wildcats colors — of the makeup of Village Council. “Hopefully we find a middle ground. Hopefully that’ll be on Jan. 10,” Kincannon said. Welcome to the Village of LaGrange! Lorain County. Just 10 miles south of Elyria, and about 35 miles southwest of Cleveland, LaGrange has seen a growth spurt because of its proximity to Cleveland and Elyria and its location six miles south of the I-480 spur (U.S. Route 20). LaGrange is approximately 20 minutes from Cleveland Hopkins International Airport, and 35 minutes from downtown Cleveland. Interstate 71 is located 20 minutes south (via State Route 301) or east (via State Route 303). 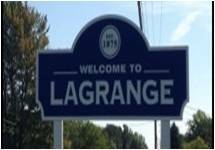 Published on Nov. 3, 2018 | Updated 2:57 a. m.
LAGRANGE — After months of contention, LaGrange and LaGrange Township have reached an agreement that effectively puts any talks of the village seceding from the township to rest. At a special meeting of the township trustees Thursday, the two sides reached an agreement to split the cost and maintenance of the LaGrange Cemetery and continue their partnership in operating LaGrange Community Park. According to the agreement, the township will “assist the village and provide burial services necessary for the operation of the LaGrange Cemetery,” the “township is permitted to charge and retain burial fees” and the township will provide maintenance services for the cemetery while the village will reimburse the township for one-half the cost of the maintenance. The two sides also will continue the current arrangement of each providing a part-time employee to provide maintenance for the community park from April 1 to Nov. 1. The deal comes days before Tuesday’s general election in which the township has a fire and EMS 3.5-mill replacement levy that would provide funds to add additional services such as staffing an overnight shift for the fire department, pay for a new off-road response vehicle and upgrade the department’s aging ambulance. One issue that was not addressed in the agreement was that of inside millage paid by village residents to the township. The village has claimed that its residents pay about $50,000 to $70,000 of inside millage each year to the township, but the residents don’t see any benefits from those taxes. Township leaders have disputed the figures of how much inside millage village residents pay. LaGrange Mayor Kim Strauss said he believed the inside millage isn’t such an issue anymore. Kincannon said the village had to compromise to avoid entering into a contract with the township to provide fire and EMS service to village residents. The two sides also hope to have open communication to help avoid similar issues in the future. Strauss said the two sides will hold meetings multiple times a year. Trustee Gary Burnett said that he believes the contention of the past year could have been avoided if the two sides had communicated more. “We should have been doing it before, to tell you the truth, but no one really thought of it,” he said. Published on Oct. 27, 2018 | Updated 3:51 a. m.
Mike Kroupa, LaGrange maintenance staff member, shows an area of the old Keystone Middle School that will soon serve as the public entrance at the new location for the LaGrange Police Department. LAGRANGE — When the village offices open for business Monday morning, those offices will look quite different. Actually, they’ll be completely different as the location of the village administration offices and police station will have moved. On Friday, the village of LaGrange closed its offices at 355 S. Center St. to move into the newly renovated offices at the old Keystone High School on Liberty Street. Mayor Kim Strauss said the village employees have been working on the move over the past week by moving “bits and pieces” while keeping the village offices open. Friday, though, they closed things down with the goal of reopening Monday morning. While the offices will be open, it’s likely to take a few weeks for the move to be complete. The village has been working on renovating the old high school and middle school, which are connected, for a couple years now — changing some of the flooring, layout and structure, while also keeping some of the style and design of the school. For example, the old library from Keystone Middle School has been renovated into the new police station, which gives the department an estimated six times more office space than it had at the old location, according to village maintenance employee Mike Kroupa. The public entrance to the police station is the lobby of the former Keystone Middle School, which remains much the same as it did when the school was in operation. Strauss said the village looked into building a new village facility, but the project would have cost about $2 million. When the renovation of the old high school is completed, Strauss estimated it will have cost about $600,000 and will give the village exponentially more space than it would have had with new construction. Over the next few weeks, work will continue on the newly renovated facility. The next Village Council meeting, which is scheduled for Nov. 13, will take place in the new facility, in what was the cafeteria in the old high school, even though the room won’t be completely ready. Once the building is completed, the village plans to hold a public open house, Strauss said. We would like to note that the Library Board was offered space at the new Municipal Complex (Old Keystone High School), but rejected the offer. The Village would like to centralize as many services in a central location as possible! Published on Oct. 27, 2018 | Updated 3:50 a. m.
The new Keystone-LaGrange Library will be moved to 133 E. Commerce Drive in LaGrange. LAGRANGE — The Keystone-LaGrange Branch of the Elyria Public Library System has found a new location. Elyria Public Library System Director Lyn Crouse said Friday that the LaGrange Village Board of Zoning Appeals voted unanimously this week to approve the conditional use by the library of the former Firefighters Community Credit Union building at 133 E. Commerce Drive. The library plans to buy the property using funds from its November 2017 levy, which is expected to generate more than $950,000 per year for the next 30 years. The closing cost of the sale has yet to be worked out, Crouse said. When completed, Crouse said, the new library will be expanded to nearly 6,000 square feet. Geotechnical and soil boring testing on the site is next, she said. Village Zoning Clerk Mary Kay Gates said the Village Planning Commission unanimously recommended at its Oct. 4 meeting to send the library’s request for conditional use of the property to the Board of Zoning Appeals. The conditional use permit was granted because the property is zoned industrial, Gates said. The library system serves the Elyria and Keystone school districts. Along with the new Keystone-LaGrange Branch, it has plans to build a new Central Branch in downtown Elyria by the end of 2020, will build a new South Branch on 15th Street in Elyria and renovate the West River Branch, also in the city.